They thought they were ready for any challenge. But the Johns Hopkins students who undertook a backpacking trek through the Adirondacks in January found themselves tested in ways they couldn't have imagined -- at minus 20 Fahrenheit. The promise of robotic-assisted surgery and the exacting tradition of hand-sewn sutures come together under one roof, in a new surgical training center on Hopkins Hospital's Blalock 12. Parasitologist Thaddeus Graczyk's bond with creatures great and small at the Baltimore Zoo -- and with the zoo's top vet -- is guiding research at the intersection of animal and human health. Pessimists within academic publishing say the demise of the scholarly monograph is imminent. 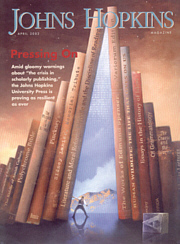 Leaders of The Johns Hopkins University Press, now celebrating its 125th anniversary, aren't buying it.